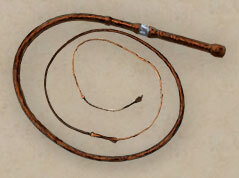 The whip consists of a ten-foot length of oiled leather, capable of stripping the skin from a man's back, or tearing his eye clean out of his face. While an effective way of inflicting pain, the whip is not so good when it comes to actual damage - however it is very useful for entangling an opponent so that they can be finished off with another weapon. Skill type: Flails (also benefits from the Whip Mastery talent). Good styles: Fox, Serpent, Hydra, Viper and Cobra.